I love Valentine’s Day. But as a Mom of a Toddler, I feel pulled in two directions. I am in love with two people– and they both have very different ideas of a good time. 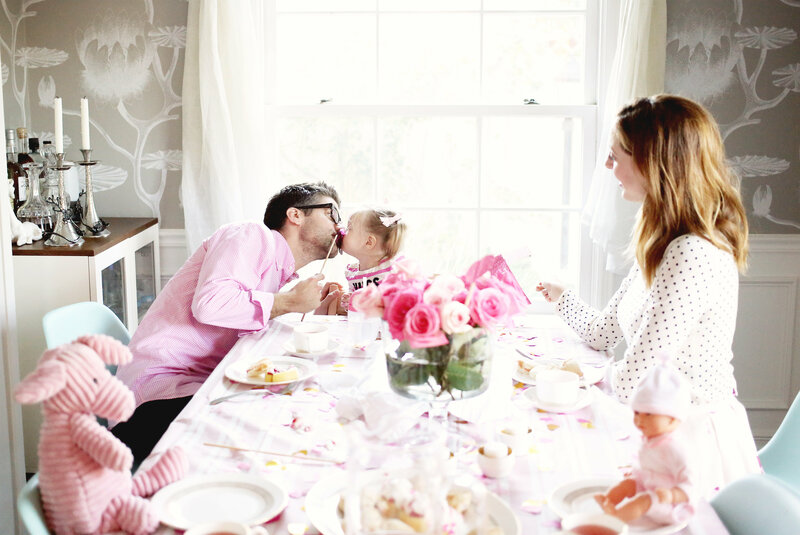 I think it’s wonderful (and important) to have romantic time with my husband, but I love my kid too! 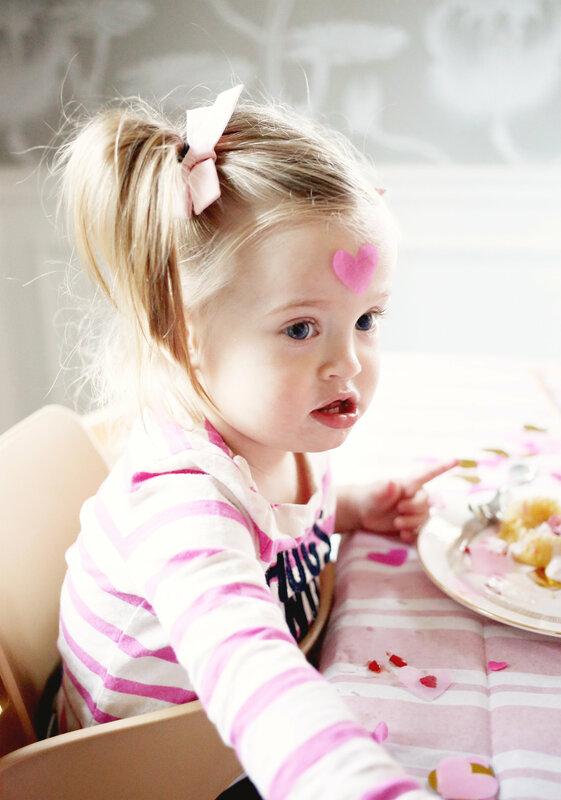 I want to celebrate with Marlowe, and have some sweet time that she enjoys as well. 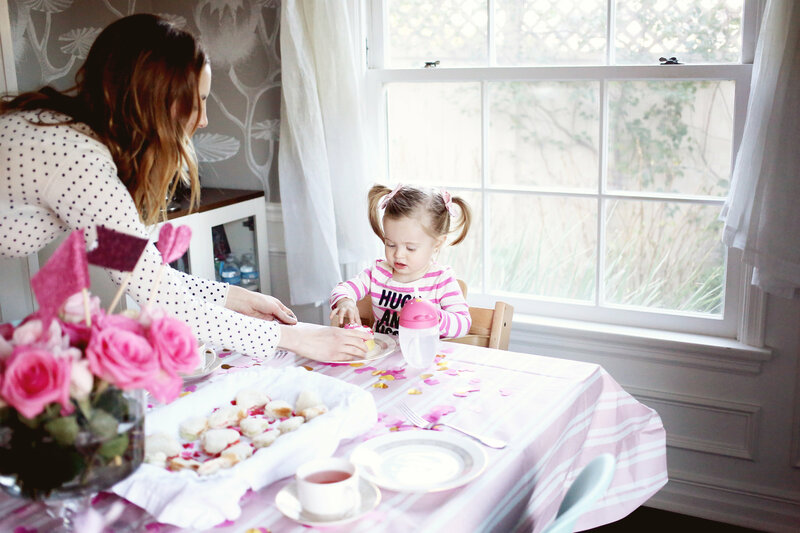 This year I decided to create a “Family Date” for us to enjoy in the afternoon on Valentine’s Day– before Mama and Daddy go out. 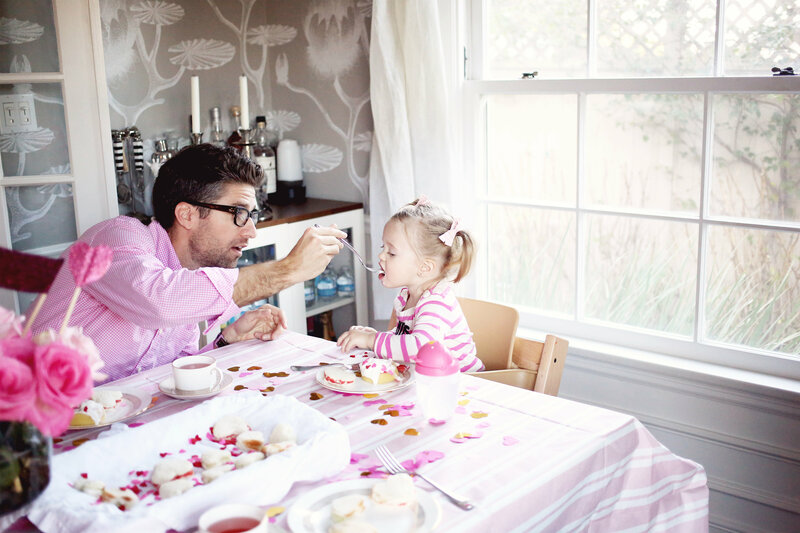 It’s an activity we can all enjoy, and it makes Marlowe feel super special. 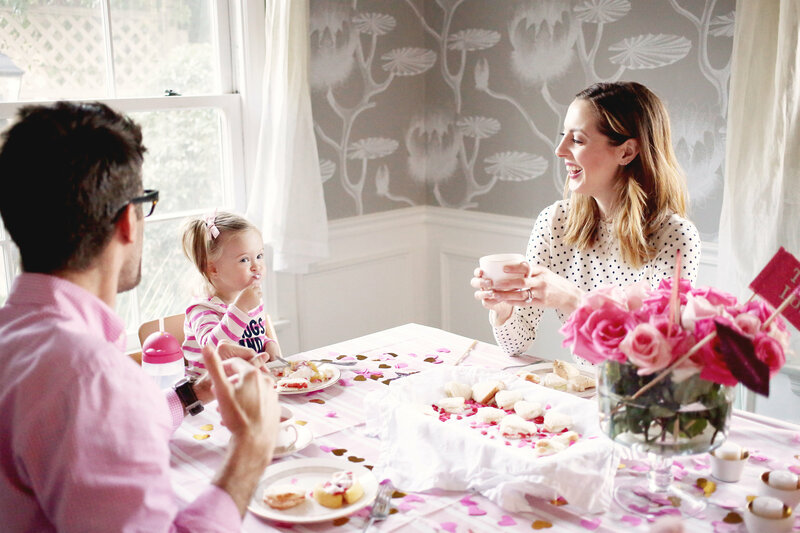 Read on for a look at my Valentine’s Day Tea Party Celebration that the whole family can participate in! 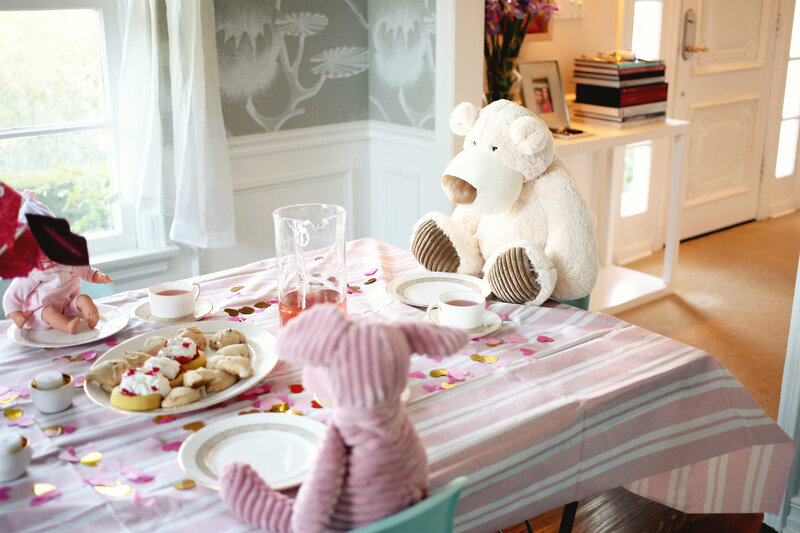 I decided I wanted to create a Tea Party, with all the fixings, and invite some of Marlowe’s best friends! Her Besties these days are of the stuffed variety– the upside of which is that they are extremely well behaved and eat almost nothing. They also don’t spill their tea even close to as much as another person I know. 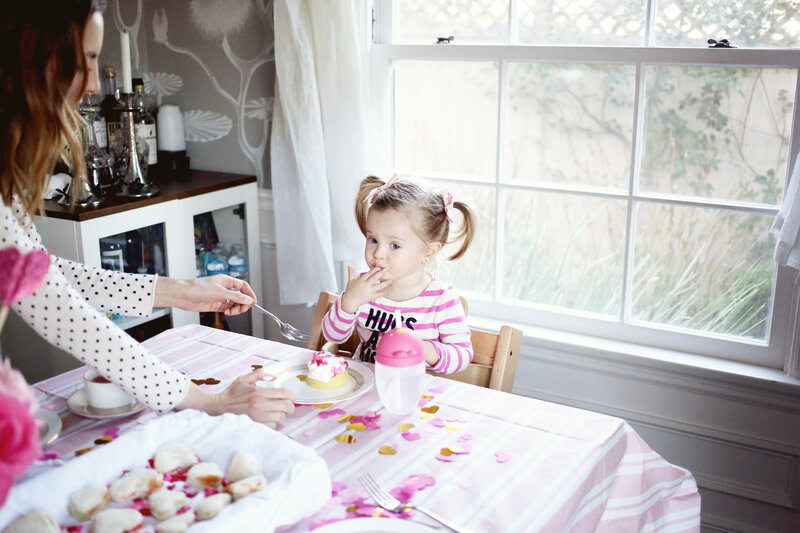 I’m actually talking about Kyle– Marlowe holds her sippy like a champ! haha. 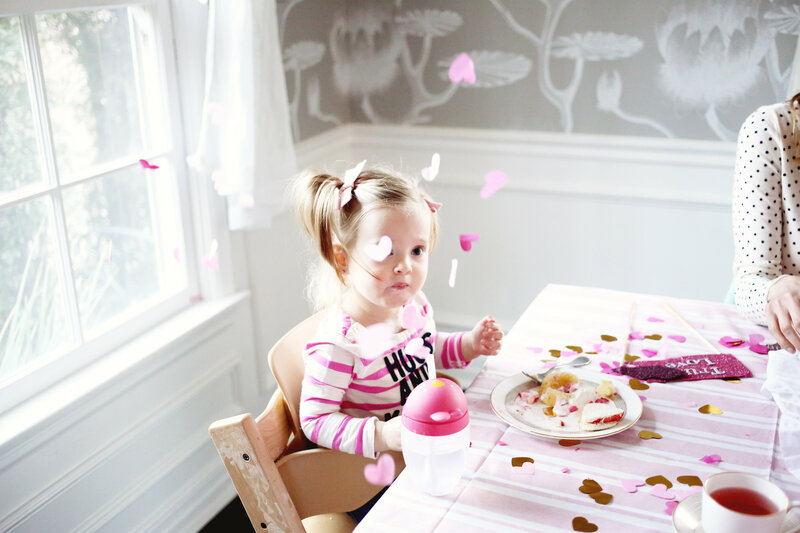 Some people deck everything out in red on Valentine’s Day, but for me this holiday is all about PINK!! 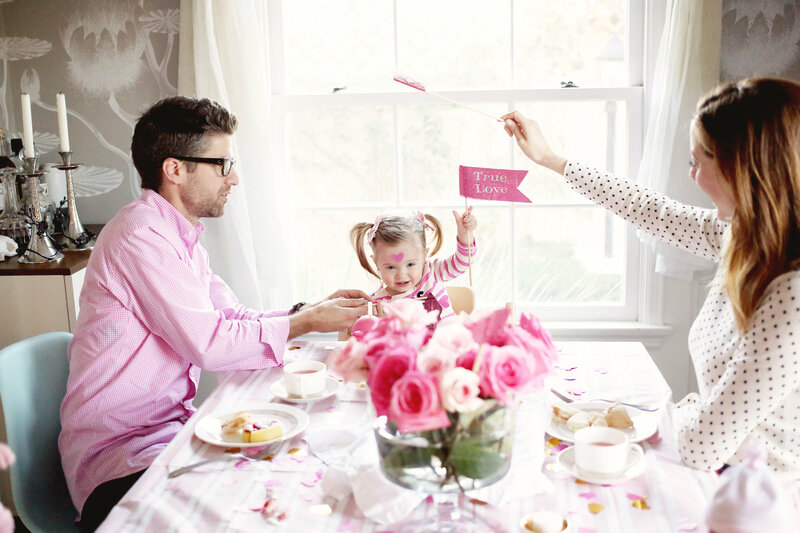 Pink is one of my favorite colors, and I just love a pink explosion whenever possible. This time I mixed it with white and gold for a glam effect. I even pulled out our wedding china to make our “date” even more special! 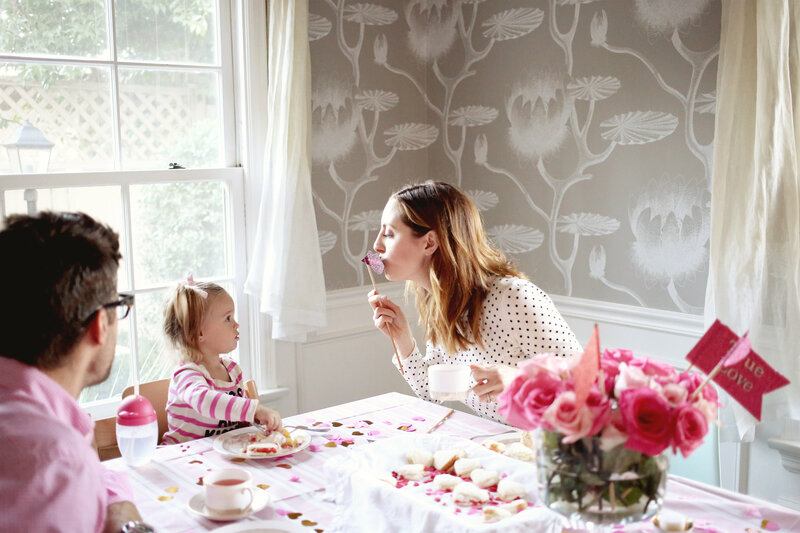 When Marlowe saw the pretty plates and tea cups, her eyes went wide and she said “Mama, WOW! Spark-tull!” What can I say– she gets it from her Mama. 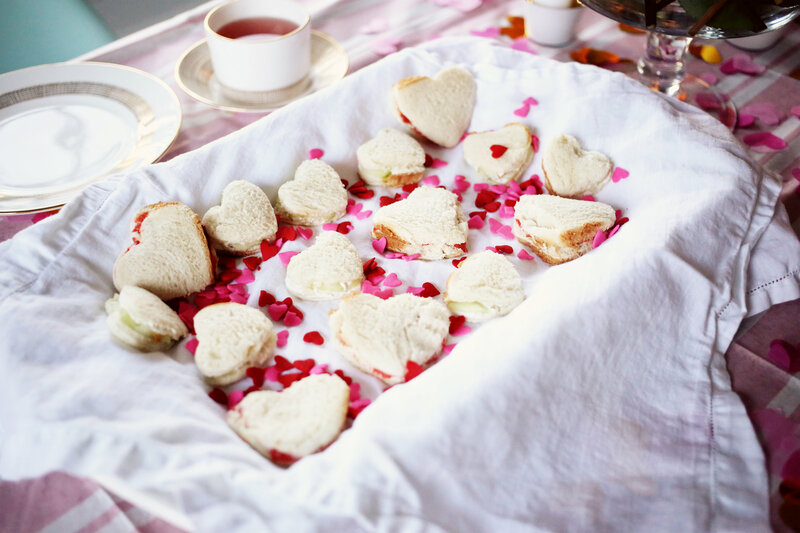 A sprinkle of jumbo sized pink and gold heart confetti pulled everything together and set the scene for the yummy party food. 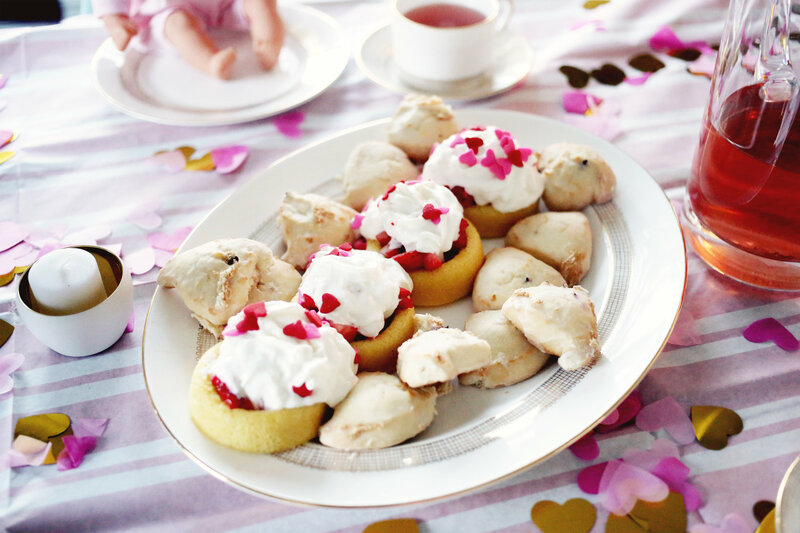 For the food, I decided to serve some sweet treats alongside some mini sandwiches– just like a fancy British High Tea! 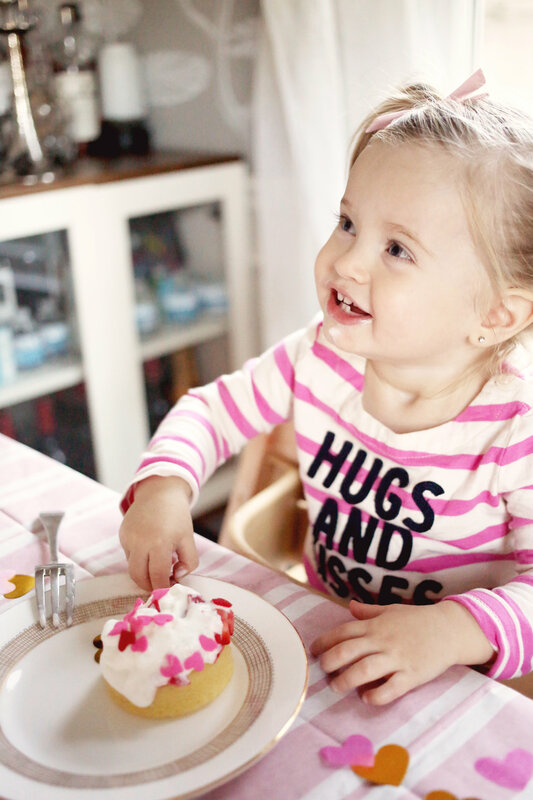 Marlowe felt so special being allowed to pile her plate high with yummy treats– little did she know they were packed with fruit and protein for a nutritious midday snack. For the tea, I made sure to make something herbal and non caffeinated. 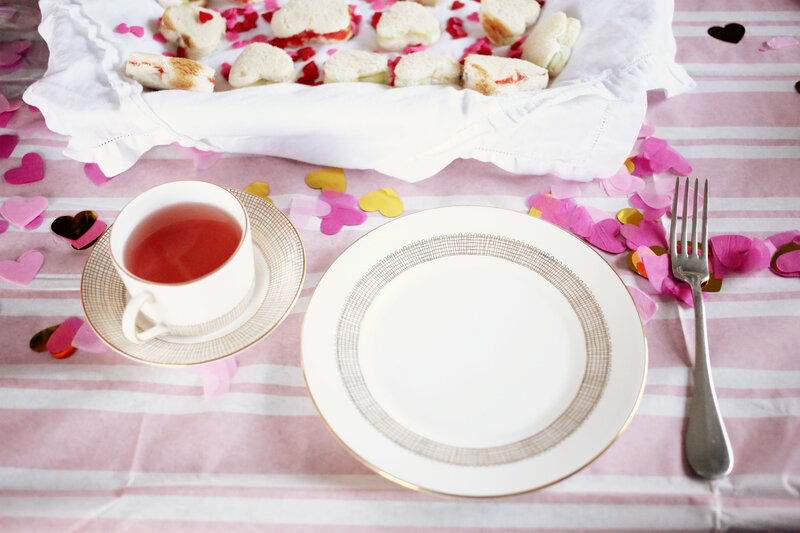 Raspberry Zinger Tea is great for this, and imparts a rosy color! Pile lots of strawberries in to the well of each nest. Pile high with whipped cream, and add a flurry of sprinkles on top. 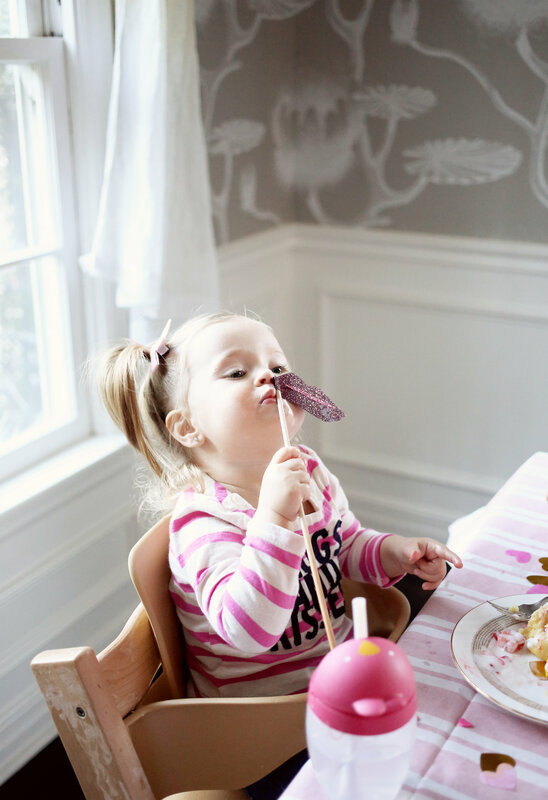 Welcome to a toddler’s favorite treat EVER. Place a thin layer of cream cheese on one side of bread. Cover with slices of cucumber, being careful not to overlap. Place another piece of bread on top, and then press firmly down with your cookie cutter! If your sandwich is big enough to make multiple shapes, make sure to start in the corner and work your way down so you can get as many shapes as possible out of one sandwich. Place a very thin layer of Creme Fraiche on one slice of bread. Place a layer of thinly sliced smoked salmon on top, being careful not to overlap. Squeeze a few drops of lemon on top of the salmon, and top with your second slice of bread. Press down firmly with your cookie cutter! If your sandwich is big enough to make multiple shapes, make sure to start in the corner and work your way down so you can get as many shapes as possible out of one sandwich. 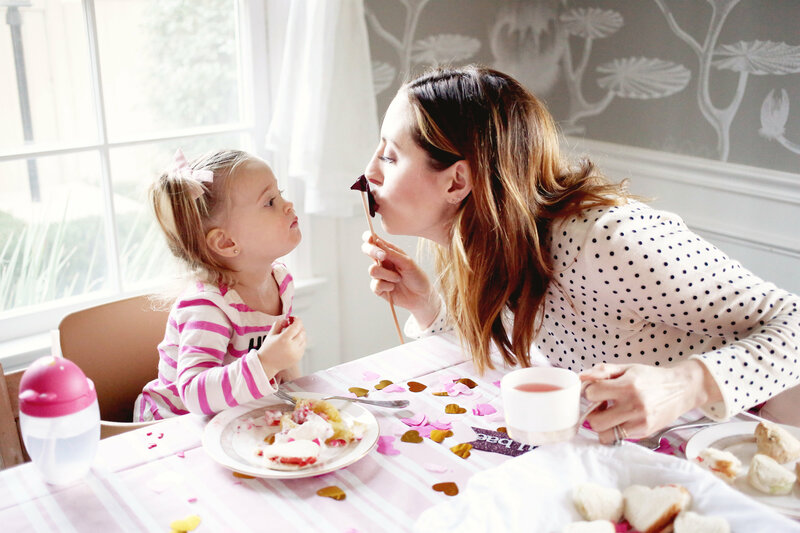 As we sat around the table enjoying our snacks, we told Marlowe that Valentine’s Day is a holiday all about celebrating the people we love! We told her how much we love her, and how lucky we are that she’s our kid. 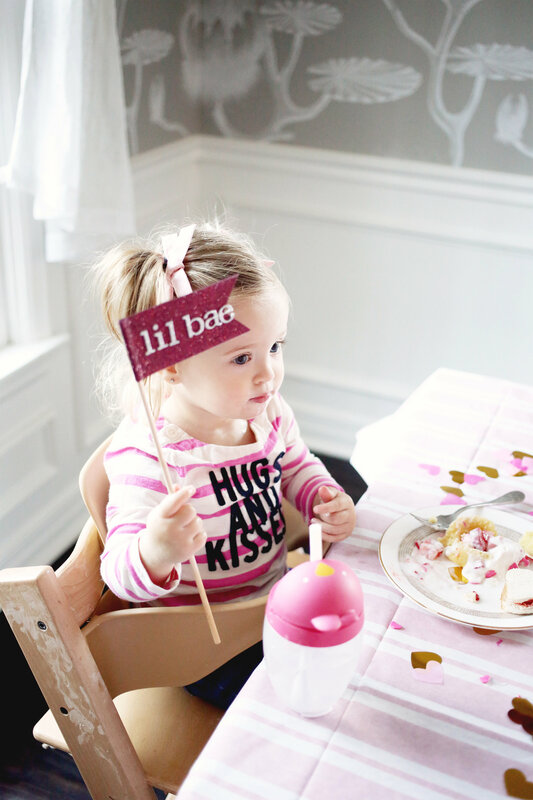 We laughed, and sang some songs, and played with our Valentine’s Day props. 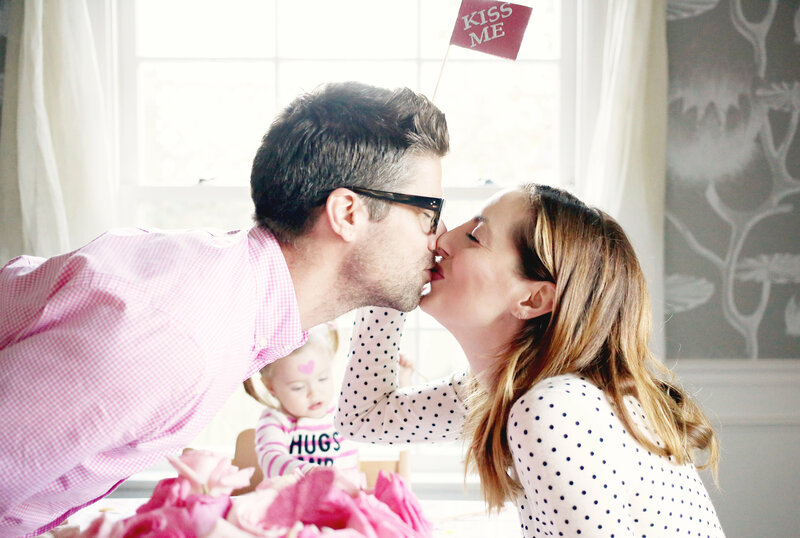 We even helped Marlowe name all of her family members and friends that she loves! Obviously cell phones were not permitted at the festivities– it was so fun to just sit around eating, sipping and enjoying each other. Truth be told, it was kind of the perfect date. 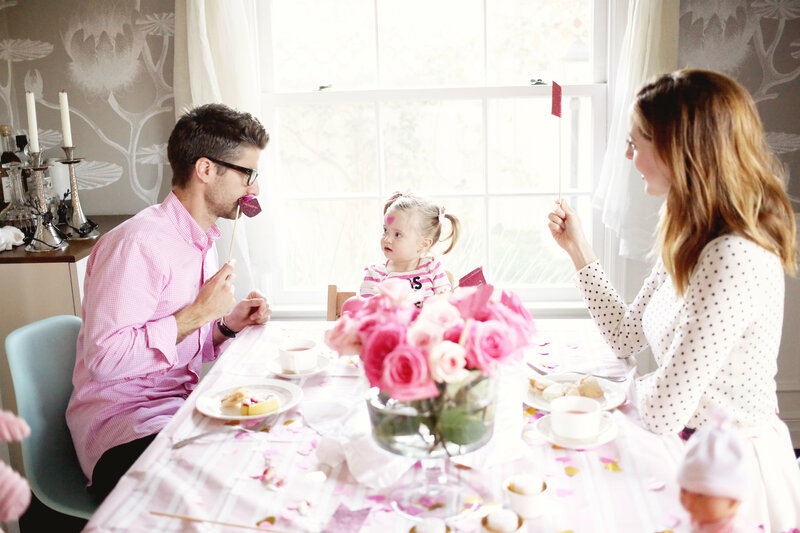 Do you guys use Valentine’s Day as an excuse to spend romantic time together as a family? I’d love to hear your plans! I just discovered your blog and am so glad I did. 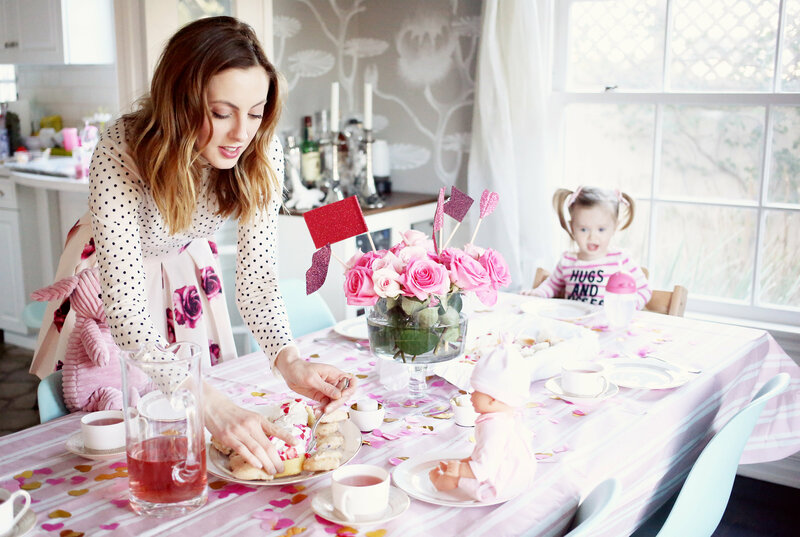 I love your approach to lifestyle blogging – not too serious which in my book is perfection! Yes! I love this idea. Our first son was 4 months old when Valentines Day came around, I was breast feeding and hesitant to be away from him. My hugs and and I ordered sushi and had a nice bottle of wine all cozy at home. One happy family. That sounds like a perfect date night to me! Yummy! *correction: Husband and I ordered. So dang cute!!! I will second the comment above – I am so happy I found your blog! I too love your approach on lifestyle – I love that I can always feel you in your posts. Happy Valentine’s Day to you and your family! Love this! Definetly trying this year. 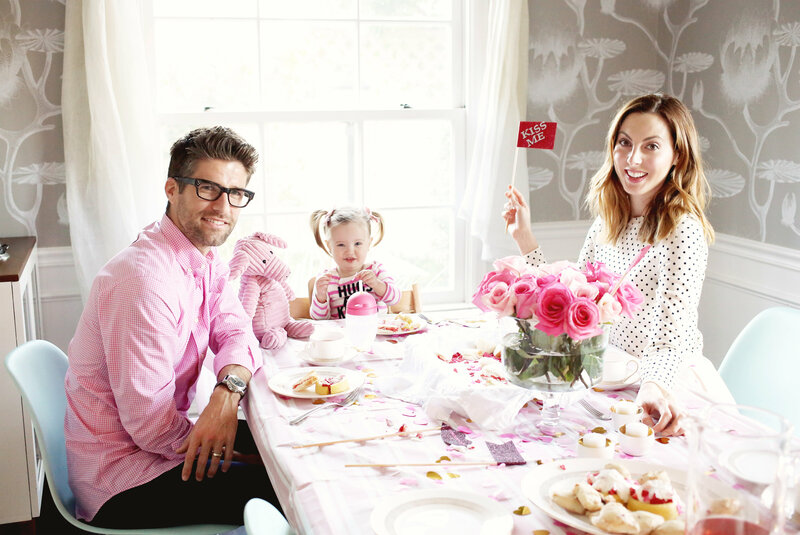 Random question but what booster seat is Marlowe sitting in, in these photos? Yes, it sure is!! The best! So cute! Definitely going to do this with my girls this year. What a fun family tradition to start! Thanks, Raina! 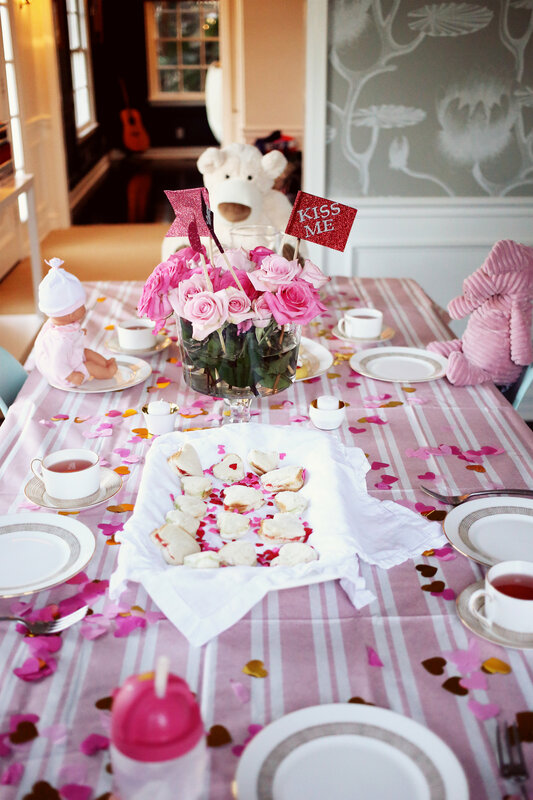 Hope you guys enjoyed your Vday Tea Party!! Anyway, I was talking with my dear friend Cara, yesterday, she is one of my soul sisters, each of us have not had an exclusive journeying boyfriend in her case, girlfriend in my case, in several calendar cycles. Cara and I have had our flowing and away from flowing friendship times. So glad we decided to reasonably pragmatically forgive each other. She reminds me of Yoda, small in size but SO strong in ethics with soul. Eva you have a wonderful husband, with a daughter you both created. It is an even deeper level of friendship. I continue my search, stay in touch with valentines in mind, but sometimes the Pony Express takes time, you know, sometimes the Pony Express hands off to the Tortise Go at a Slower Pace…. That’s ok, in Aesops Fables it is not the Pony nor the Hare that wins, it is the Tortise. As long as the Tortise is sincerely humble, with ethics at his or her foundation. Also wise tortoises when not exclusive are always collecting numbers, until the woman provides the exclusive offer, then it is decision time. Sorry to be on a Disney theme with some of my posts, but on youtube, or amazon you may be able to find that classic animated short. Sacrificing maintaining a car, to travel, with the rich learning it brings opportunities for, is something for the parents of older children (your high school to college level young adults) at Eva’s superior blog to consider. My friend Cara with me have talked about my travels, she is much older than me, she had a very different life path in terms of financial security, she longs to travel to Paris. We have talked about maybe she had a past Cloud Atlas moment there, that is a nice film to ponder. Anyway a call to dear friends, to me is what Valentines day is about. 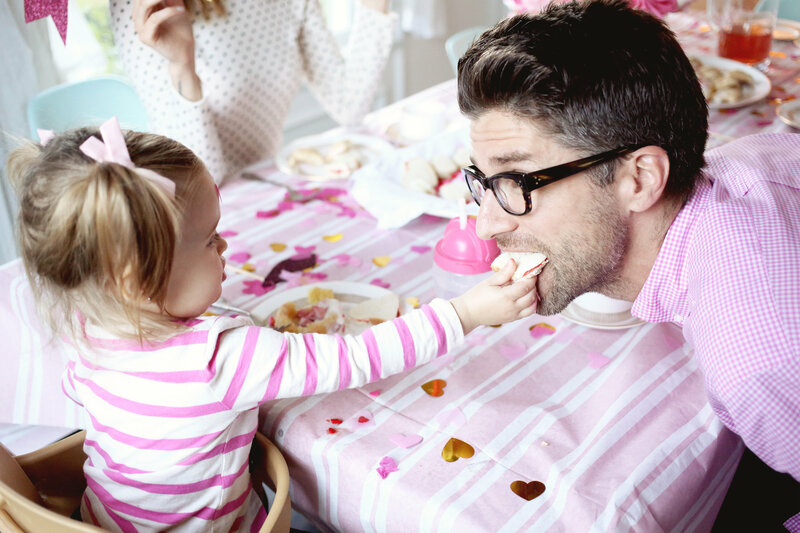 Someday, as with many at Eva’s superior blog, we will be as fortunate as her, as with the coupled co leaders here at her superior blog, to share with a partner that deeper closeness. 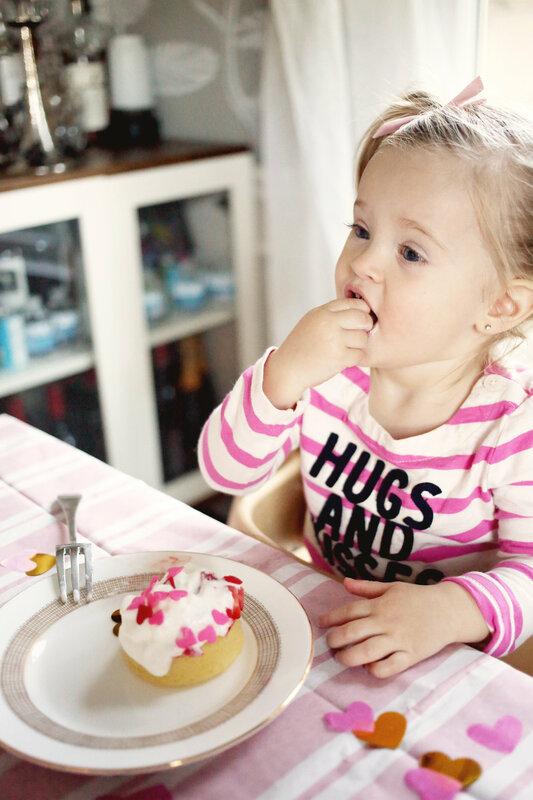 Eva thanks for sharing about your creative artistiness, shared with your family, with some tea that Her Majesty The Queen of England would be content with. I like my tea English Breakfast style with two pumps of peppermint. Eva, sincerely thank you, for all the people you help, with your superior blog. This is a very interesting story! Thanks for sharing!